I hope these resources inspired by my new rugby trilogy Rugby Academy and Scrum! 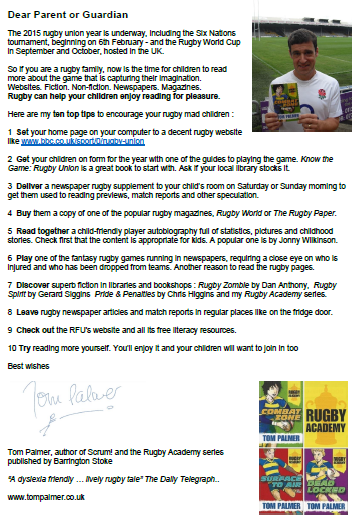 will help children who love rugby to love reading. 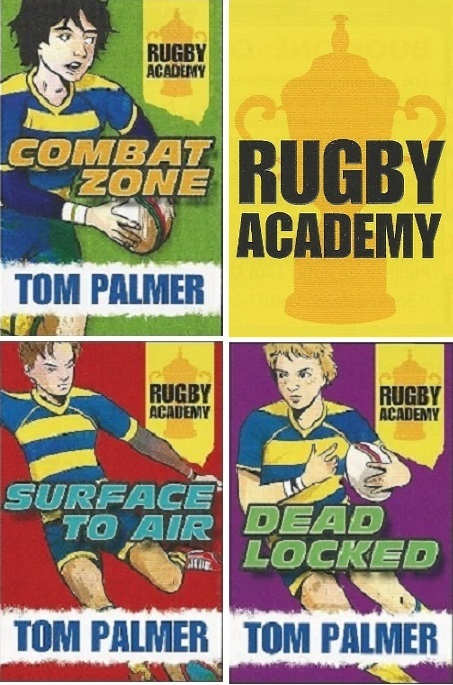 Tell me when you’ve read all three Rugby Academy books and I’ll send you a signed certificate (via your school if you prefer) by emailing me direct here. Watch me read from Scrum! and ask quiz questions here. 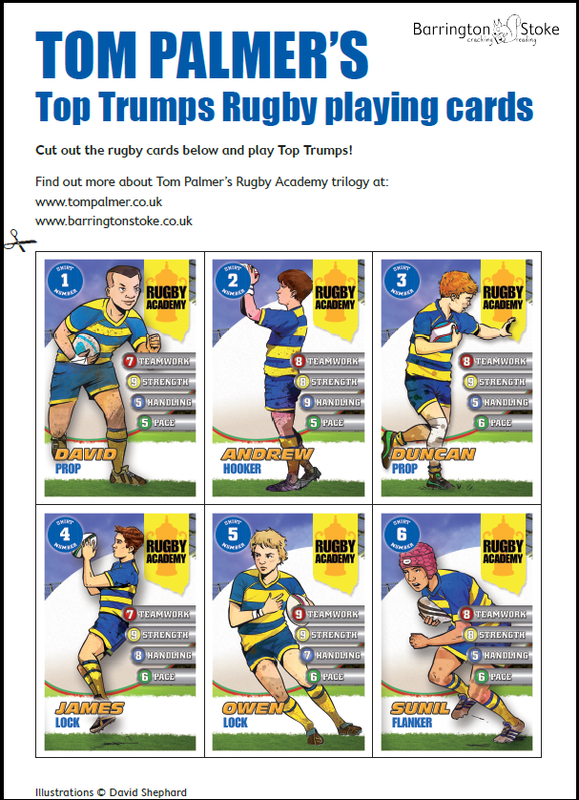 Play Top Trumps with the full set of player cards here. Read the live online story from the Rugby World Cup. It is not too late to catch up with the live online classroom readable story, more here. Watch out for my projects with England Rugby this year, to mark this autumn’s Rugby World Cup, all free to download after you register. Download my National Literacy Trust Love Rugby : Love Reading Rugby World Cup 2011 Toolkit here. “It is not long until the Rugby World Cup with the first game on 9th September. The excitement is already building for this international tournament that brings the best rugby nations together. With much media coverage, we’ll all get caught up in the anticipation and expectations of our favourite teams. With this global simultaneous interest in rugby, there is no better time than now to make use of this World Cup themed tool kit to stimulate children to improve their reading and writing skills. In my opinion, literacy is the foundation to learning; it is fundamental to progressing in life and is not to be taken for granted. Having struggled to confront my dyslexia in my early years and into adulthood, I am passionate about the value of literacy to enable you to have a normal life. I know from personal experience that having problems with literacy can affect attainment in other subjects. Children must be taught that reading and writing can be fun and that it is not just for geeks but is an essential skill for everyday life. Even professional sportsmen have to send emails, write letters and read books. More literacy resources click here.